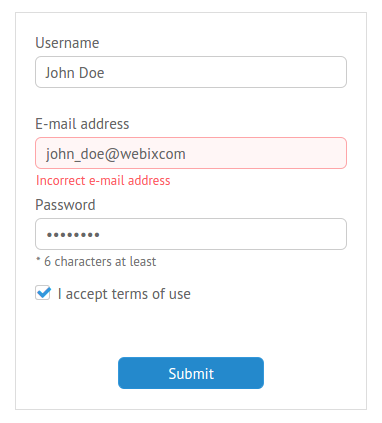 Starting with version 2.4, Webix provides you with a new way of user interaction improvement. Validation Messages can be pretty useful in case you want to make sure that users will fill in all your web forms properly. 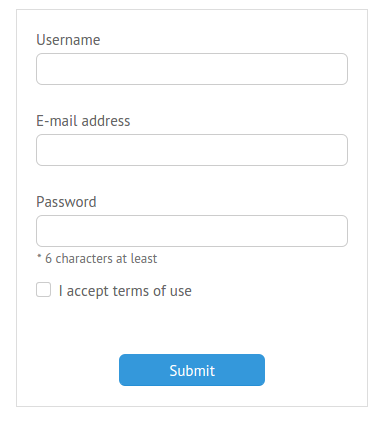 You can check the Form documentation page if you want to get more details of form creation with Webix. isChecked – checks whether a checkbox is checked. You should “connect” the needed rule to a proper form field through the name property. To inform a user in case the inserted value is incorrect, Validation Message is used. You can use this feature by adding the invalidMessage property to the field description. This property will set the text of the message which will appear in case the input string doesn’t comply with the set rule. Now the field with incorrect input value is highlighted and there is the error message that we have defined earlier. As you can see, it’s pretty easy to avoid possible misunderstandings using the Validation Message feature. And don’t forget to get the latest version of Webix before you try this! You can check out the source code and the demo of this example in the snippet editor.